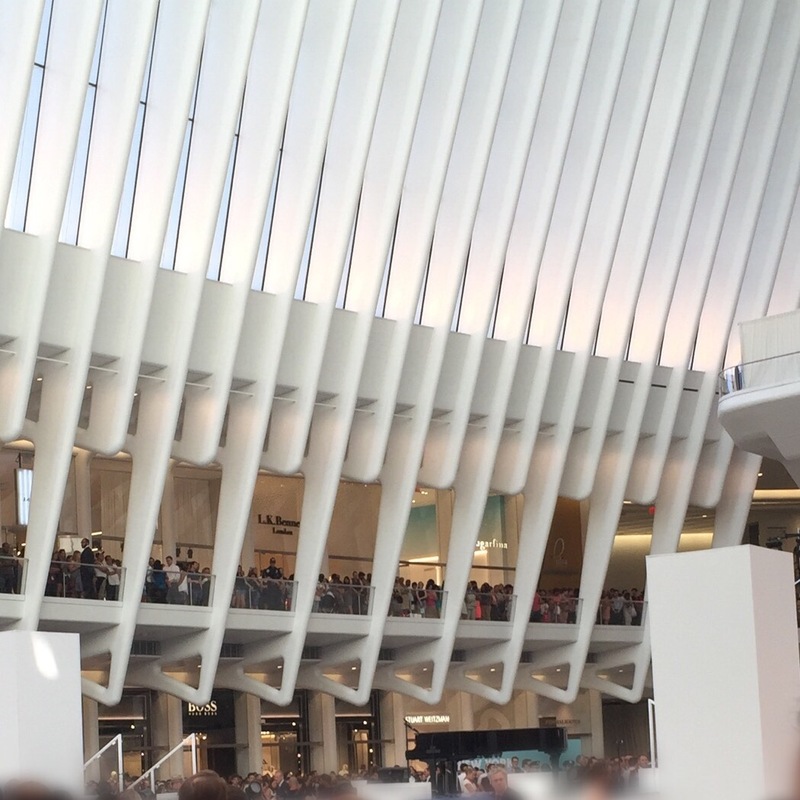 I’ve been freelancing at the brand new Westfield WTC global shopping and dinning center. 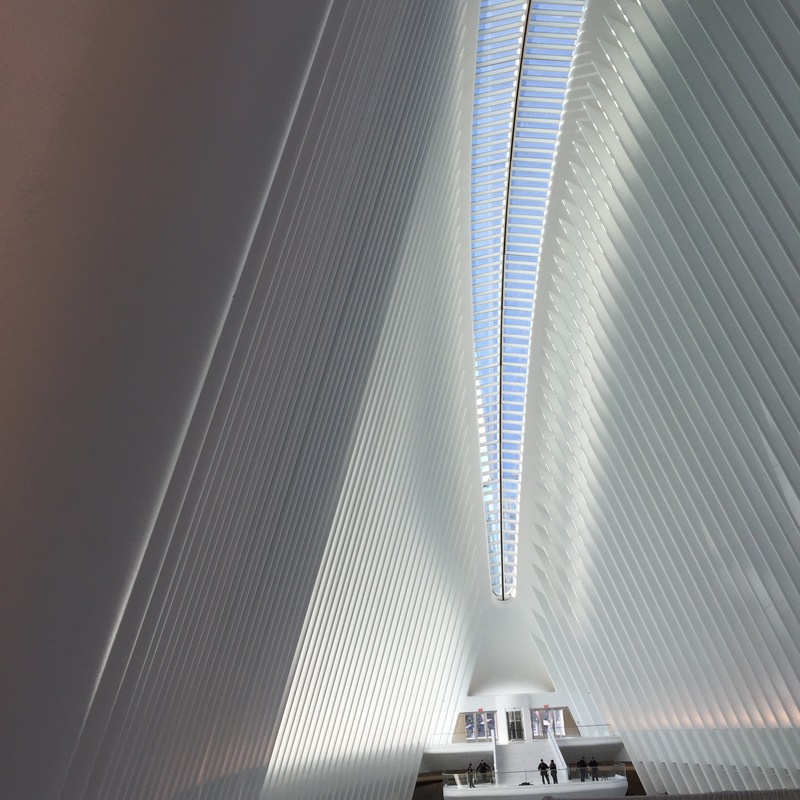 Built in honor of the 9/11 victims and their families the space is light, bright and airy. Designed by Santiago Calatrava it is meant to look like a dove being released from a child’s hands. Built at an angle that allows a wedge of light to shine through the two vertical skylights every September 11th at 10:28 am the time at which the north tower collapsed. 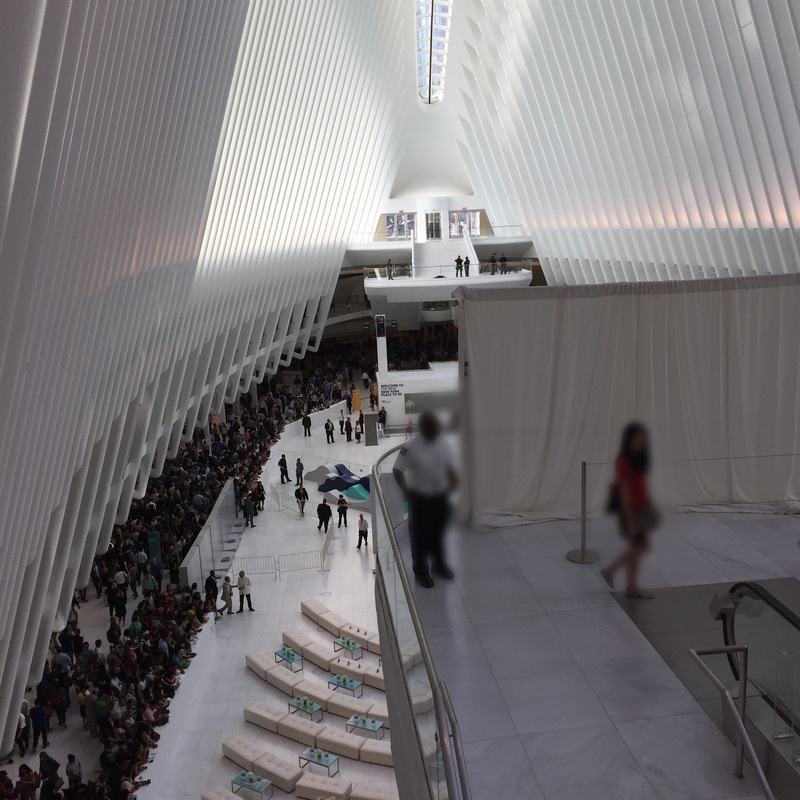 At which point you will see two vertical shadows on the floor of the Oculus as if the twin towers were still there. I’ve gotten to see the two shadows which is an impressive, moving and beautiful sight. 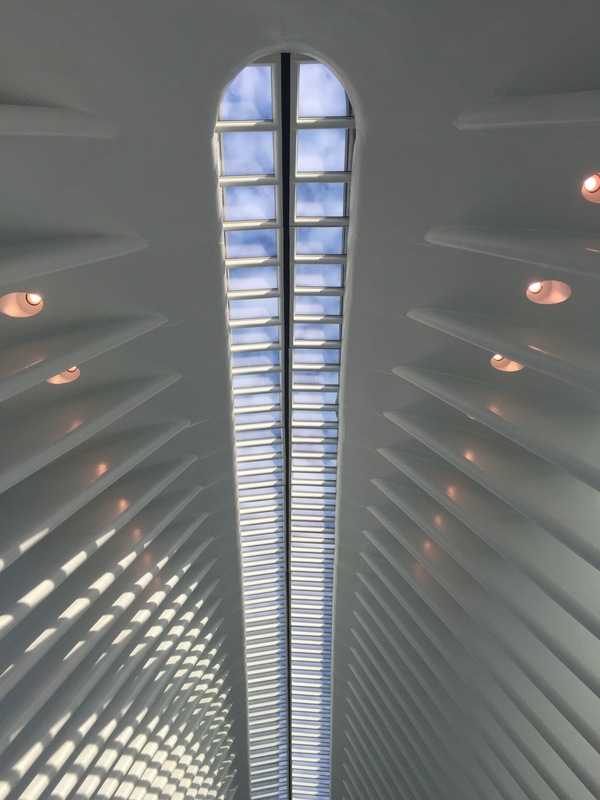 For many people who live in lower Manhattan and 300,000 commutters the opening of this transportation hub is a relief and a long time coming. No longer do people have to go into midtown to find a major shopping center. Connections via the middle oculus include most of the subway lines, PATH to New Jersey, shuttle, NYC water ferry and Fulton Center. Within walking distance to the 9/11 Memorial and the Observatory at One World Trade Center it attracts both the locals and tourist. There is also access to Brookfield Place and the North Cove Marina via underground access from Westfield WTC. Tourists can also buy attraction and show tickets at the concierge desk in the Oculus. On oppening day August 16th there was a flag ceremony and Family Day events for families of 9/11 victims. The families were invited and given designated access to the concert area where Leslie Odom Jr., School of Rock, Dr. Draw, Harlem Gospel Choir sang “O Happy Day”, Pharell’s “Happy” and The Voice season 9 winner Jordan Smith performed Sia’s “Chandelier”. Special guest John Legend preformed in the evening. Following the performance the VIP guest were shown to Eatly connected underground in tower four for dinner. Stores that opened the 16th had events and promotions. Some offers included free mini facials from Caudalie, free metro card with purchase at Aldo and complementary gift at & Other Stories. Shoppers also got to learn how to make fresh pasta at Eatly. Some stores like Forever 21 ran events through the rest of the week. 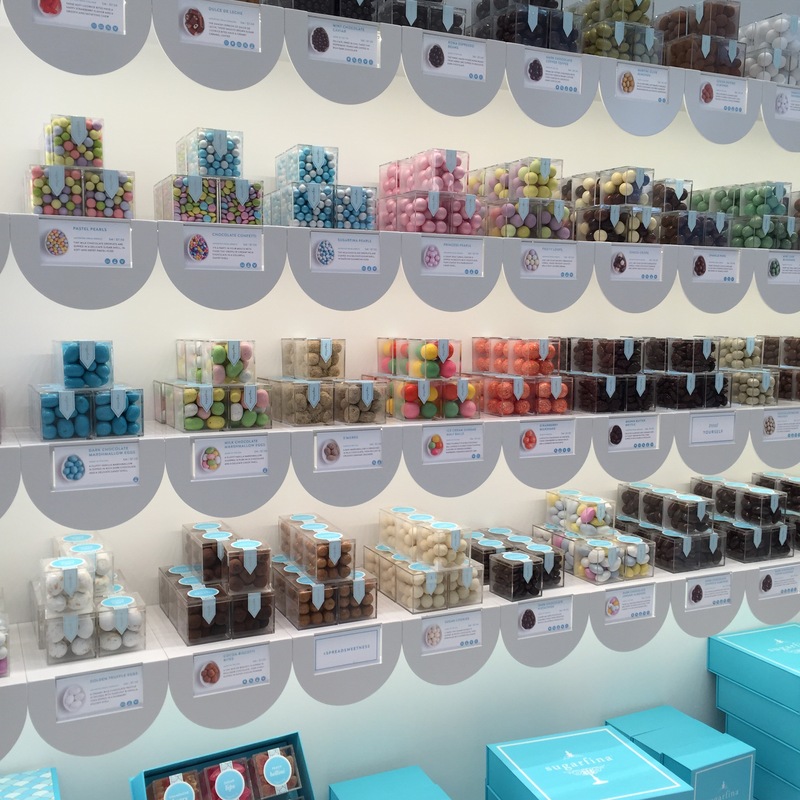 Candy store Sugarfina gave out Champaign gummy bears to celebrate the occasion. Many stores chose this venue to enter the US market or grow their retail presence. Asia’s children’s store KingKow now has its first US store in the west concourse connected through the Oculus. Reiss London opened their first Manhattan location, Folli Follie and Kit and Ace added their third NYC store. While London’s Turnbull and Asser opened their second NYC location. Some might think that The World Trade Center is not an ideal place for a global shopping center. On the contrary it should be seen as symbol of USA’s preserverence. If you get a chance to check it out let me know your thoughts. Thanks for the pics. I can’t wait to visit when I’m in NYC again in a month! You are very welcome. Yes it is a must see when you visit. Let me know your thoughts when you do. Thank You. If you get a chance to check it out let me know your thoughts! Love the photos. Going to have to check it out!